Way to spread the love by making two! Someone will love those bright colors and cherish these. quilts are always so nice to have at the hospital…as a nurse i must say thank you! So fun & bright! I'm sure they will be appreciated! You are making it work and finishing up old WIPs - awesome! Great job! Perfect for kids. Lots of goodies in that kit. Good choice to make two - love the simple piecing that lets the fabrics shine! These are fabulous Anja! a great way to use fabric that may not be one your LOVE list anymore - a great cause! All those bright colors will definitely brighten up a child's day. Isn't it funny how we forget why we bought something? But what you are going to use them for, is such a great cause. Beautiful and bright. Two children are going to be very happy. 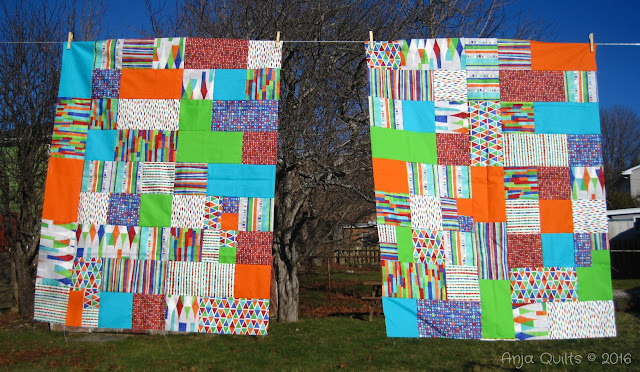 These two happy quilt tops are going to make for two very happy recipients. Perfect way to send some quilty cheering up to those in need! 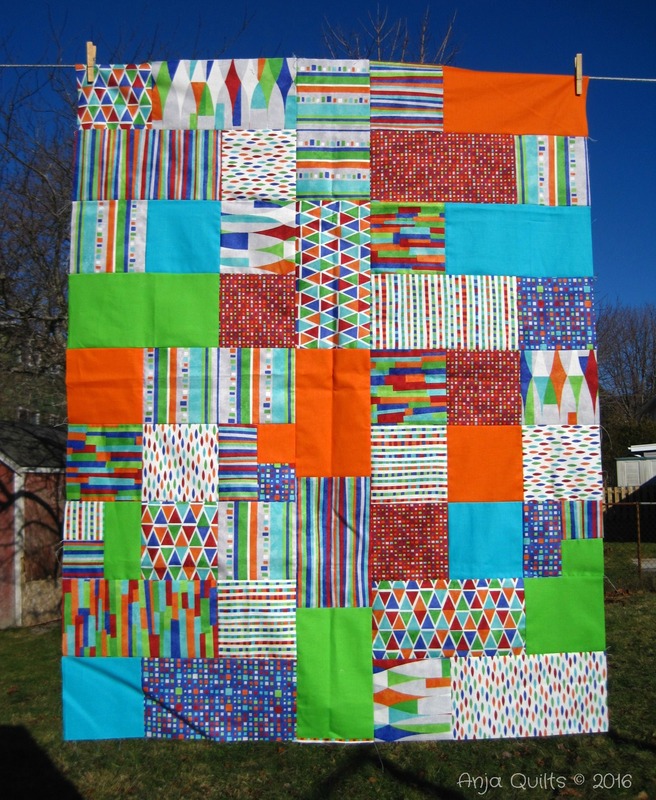 That would make one crazy large quilt. It's much better as two bright little ones for kids. I'm impressed at how you are motoring through your stash. My those quilts brighten up a day. I bet the lucky recipients will love them! They are bright and colourful. I am sure there will be two special persons who will love them! Very fun quilts, the children at the hospital will love them! 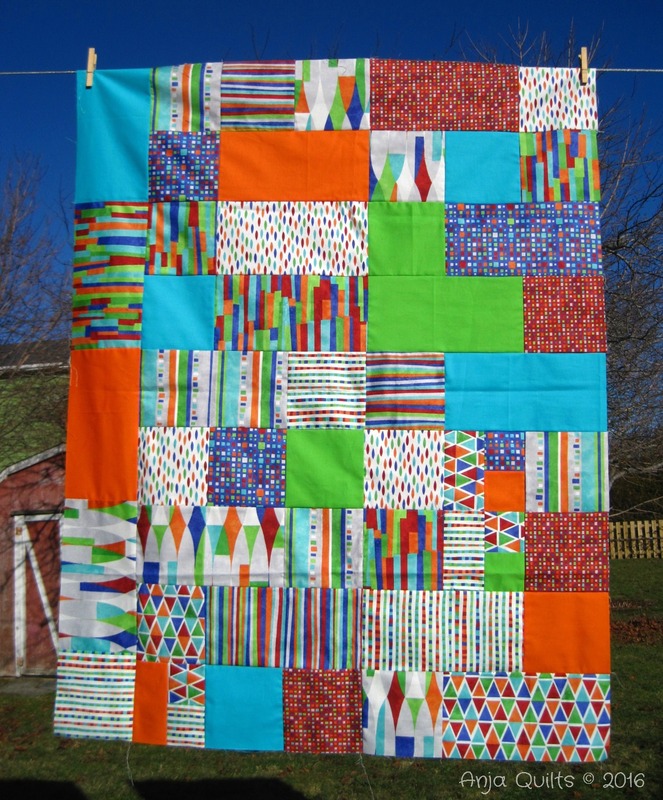 It is a good simple pattern to use the bold prints and the quilts will be much appreciated by the kids. Kits are funny like that. I have only ever bought one. I loved it when I ordered it, but it was not as much fun to make as if I had agonised over the fabrics myself. The perfect quilts to light up a child's life.